Rotella begins by assuring us that he has little interest in finance, but "pounces on" each issue of Jeremy Grantham's quarterly newsletter. Why? "To begin with, he’s a doomsayer, a Cassandra with a bracingly clear vision of looming difficulties... I appreciate doomsaying as an art form..."
Note: The article uses a more current picture of Grantham than this one from Google Images. He quotes Grantham on one specific challenge we avoid facing: "We owe almost everything we have had in the way of scientific and economic progress and the growth of the world’s food supplies and population to fossil fuels" which are becoming harder and costlier to produce. "We want to hear good news and assume that present conditions will persist, we tend to be bad with numbers and uncertainty, and we take comfort in short-term-oriented herd behavior of the sort that characterizes the financial industry. 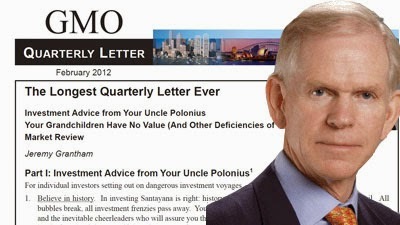 We need doomsayers like Grantham to counteract these tendencies." The quote in a text box in the article goes beyond Greenspan's irrational exhuberance: "Grantham’s quarterly letters feel like an antidote to the magical thinking purveyed by Congress and hysterically optimistic stock-pickers." Hamilton interlaces an unfamiliar technique through this satisfying mystery. The familiar elements of Alex McKnight, the reliability of his steadfast friends and the frightful Upper Peninsula environment confront twists and turns of evil that keep you guessing - and reading. I "had it figured out" more than once, only to find the plot bobbing and weaving and deflecting my comprehension. While reviewing the fourth in the series, North of Nowhere, I wrote, "The satisfying conclusion left questions hanging about the fate of a couple of the characters." One relationship in particular (no, not a romantic one) I hoped to see evolve in an ironic yet believable way. Hamilton finds a way to accomplish this that doesn't insult the reader's intelligence, but rather feels inevitable and "bonds" the reader even more closely with the characters. 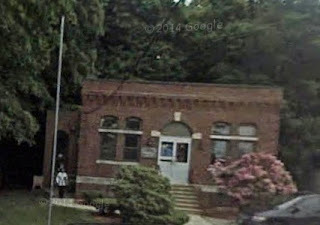 DUDLEY — Selectmen have accepted an $85,000 bid from the owner of the Dippin' Donuts on West Main Street for the vacant building that served as the town library for more than 100 years. Donna Karapatsas' was the higher of two proposals for the 3,000-square-foot brick building located on the other side of Village Street from her business. "It met the specifications and also offered the town the highest amount of money," Town Administrator Greg L. Balukonis told selectmen Monday. He recommended the board accept the bid from Ms. Karapatsas because it was "highly advantageous and in the best interests of the town." Mr. Balukonis said her proposal stated the old library parking lot would be used for doughnut shop employees. The building interior would be renovated for storage and office space. Renovations to the exterior, he said, would be in keeping with the present building's style. "I think the new owner will be a good steward of that property," Selectman John J. Marsi said. 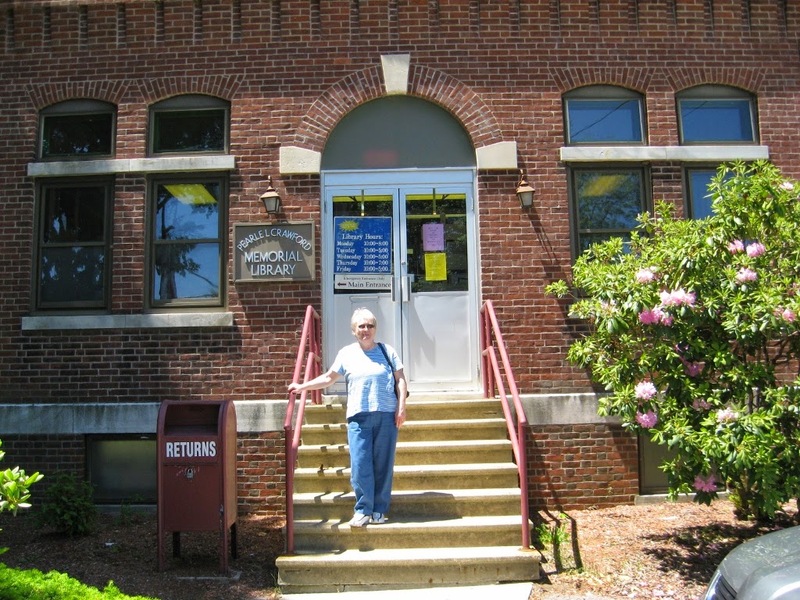 The library, built on the edge of a prominent mill village in 1901, had served the town for more than a century when it closed four years ago. Town meeting voters authorized selectmen to dispose, sell or transfer it, yet an attempt last year to sell the property for $75,000 failed to attract bidders. In putting the site up for sale in October, Mr. Balukonis said, the town's goal was to eliminate the expense of maintaining the old building while generating revenue. To aid in its sale, the library was among four parcels on Village Street that were rezoned from residential to business by voters at the October town meeting. By way of requirements set in the request for proposals, the town sought to retain the integrity of the building exterior because of its significant history. Henry Hale Stevens incorporated Stevens Linen Assoc. in 1846 and constructed the main mill near the library in the early 1860s. 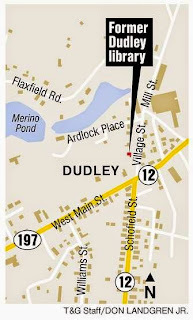 Its twin six-story towers stood over what became the largest of five mill villages in Dudley. 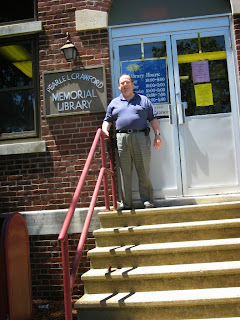 Mr. Stevens donated land for the town to construct the library in 1901. 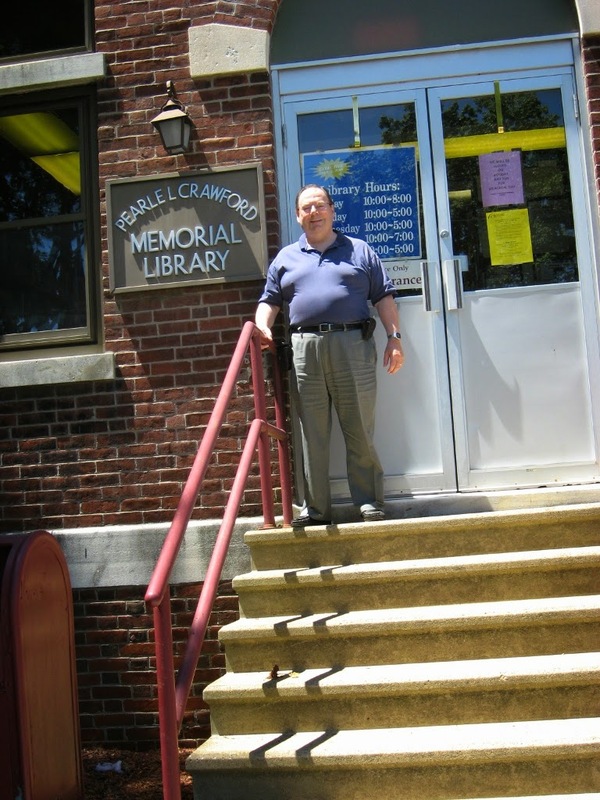 In 1972 it was renamed in honor of former trustee Pearle L. Crawford for her many contributions to the library and the community. 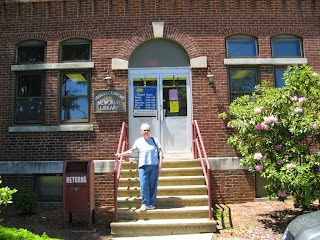 After 109 years, the small confines of the library at 1 Village St. were replaced by a new library on Schofield Avenue. The story below is familiar to many Directors of multi-level libraries. [I originally wrote "multi-story libraries" but even the smallest library has many "stories." Ouch, bad pun.] Worrying about elevator inspections may be the last thing most people associate with a Library Director's work. For years staff shortages in the inspection department made it impossible to schedule timely re-inspections - something I had to explain repeatedly to concerned patrons who saw the out-of-date certificates. More than one third of the registered elevators in Massachusetts — 14,211 in all — had expired inspection certificates in 2012, according to findings released by the office of state Auditor Suzanne M. Bump on Tuesday. Bump’s office said in a statement that an audit of inspections statewide showed 25,250 elevators, or about 64 percent of the 39,461 registered, had valid certificates as of October 2012. More than 1,700 certificates had been expired for more than four years, auditors found. “Uninspected elevators not only represent a safety risk to the public but also lost revenue to the Commonwealth,” Bump’s office said. The auditor said that Massachusetts may have missed out on more than $3 million from inspection fees that the state Department of Public Safety, which oversees the inspections, did not collect during that period. The Public Safety department disputed the findings, however, saying that the compliance rate as of October 2012 was approximately 72 percent. The department also noted that elevator owners are responsible by law for renewing their certifications. In addition, the department said it began sending notices in the spring of 2013 to alert elevator owners that their inspection certificates will expire in 90 days. The agency also said it will launch an updated inspection system later this year. Currently, the compliance rate for inspections has risen to more than 80 percent, based on monthly benchmark reports, said Terrel Harris, a spokesman for Public Safety. The audit — which also reviewed the state’s oversight of amusement rides and ticket reseller operations — was made public months after a woman was seriously injured in May when she fell down an elevator shaft at Fenway Park after a Red Sox game. The elevator’s inspection certificate was valid at the time. The team’s majority owner, John Henry, also owns The Boston Globe. Travis Andersen can be reached at travis.andersen @globe.com. [NOTE:] The article as posted had the following paragraph, which I believe I corrected by moving the quote to the end of the preceding one beginning "But Bump..." I think a wayward click may have inserted what I moved into the middle of the word "ride." The audit — which also reviewed the state’s oversight of amusement r“The Department of Public Safety is the public’s watchdog to ensure building owners are held accountable and elevators are safe,” she said. “To be accountable itself, the agency must raise itself to higher standards.” ides and ticket reseller operations — was made public months after a woman was seriously injured in May when she fell down an elevator shaft at Fenway Park after a Red Sox game. The elevator’s inspection certificate was valid at the time. What is it like to live on Worcester’s West Side? 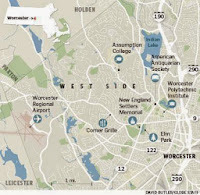 “Worcester’s counterpart to the tony suburbs of Wellesley, Brookline, and Newton” is how a City of Worcester website describes the West Side. Indeed, the neighborhood is so pretty that a newcomer traveling through the city and ending up here might feel a bit like Dorothy: I don’t think I’m in Worcester anymore. Despite the distinctly suburban feel, yes, it is Worcester. Lovers of old homes will salivate at the grand houses. In fact, Worcester has three historic districts, two on the West Side. The Massachusetts Avenue one, established in 1975, encompasses 21 properties covering roughly 14 acres. The neighboring Montvale Historic District includes 57 properties north of Salisbury Street, one of the main roadways on the West Side. Both historic districts predominately comprise turn-of-the-last-century homes of varied architectural styles. 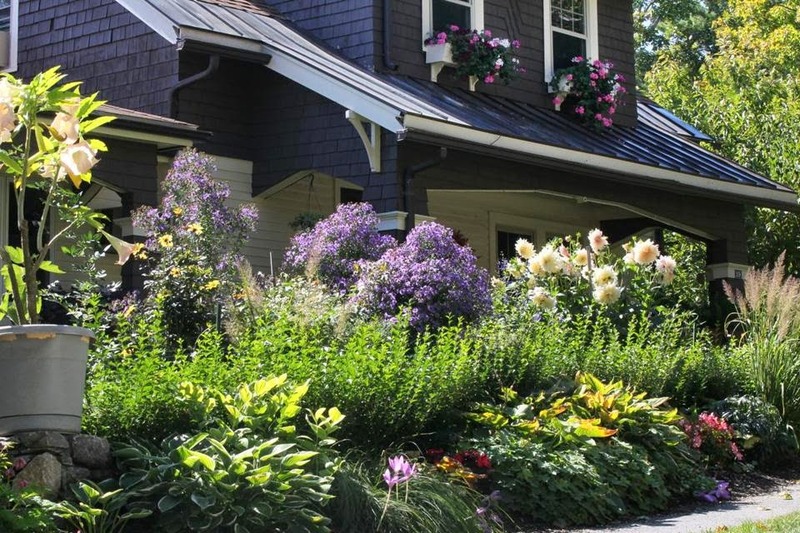 While the homes are every bit as beautiful as similar ones closer to Boston, the prices are much lower. And though Worcester doesn’t have everything Boston has to offer, it boasts the Worcester Art Museum, the American Antiquarian Society, Mechanics Hall, great hospitals, professional sports teams, ethnic markets, and restaurants galore, particularly on Shrewsbury Street, in the city’s traditionally Italian neighborhood. Meanwhile, the second largest city in New England is undergoing a revival. (No, really, this time it’s actually happening.) The $563 million CitySquare project in downtown Worcester is creating more than 2.2 million square feet of retail, medical, and residential space, as well as a more pedestrian-friendly street pattern. “The Woo” is set to wow. The amount that graphic artist Harvey R. Ball, a Worcester native, was paid to create the Smiley Face button as part of a employee morale campaign for a local insurance company in 1963. Museum . Others have claimed credit for it — and made a lot of money. To date, the number of infected or at-risk trees cut down in Worcester and some neighboring towns to control infestations of Asian longhorned beetles. A local initiative recently celebrated the planting of 30,000 trees. The best a Massachusetts team has ever done in the Little League World Series US final, achieved in 2002 by the West Side’s Jesse Burkett Little League All-Stars and a team from Saugus the following year. Beautiful homes at comparatively low prices. On the West Side, a gorgeous 3,721-square-foot home on Lenox Street updated but with loads of old-house-details preserved, recently sold for $385,000. Though it’s known as the “Heart of the Commonwealth” (which is why the city seal and flag bear a heart), it’s likely you’ve heard it referred to as the “armpit of Massachusetts.” So, if you live here, you may have to put up with that anti-Worcester attitude. Call it the ignorance of the arrogant. Elm Park was designed by Frederick Law Olmsted and is listed on the National Register of Historic Places. 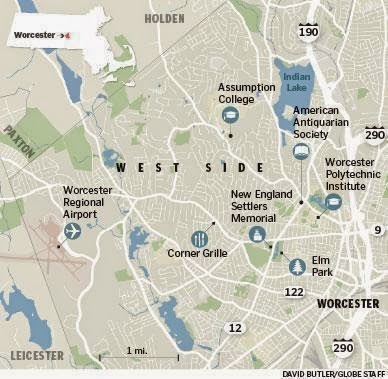 In all, there are about 1,250 acres of parkland in Worcester. It’s improving, but for a city with 10 colleges and universities (Clark University, Worcester Polytechnic Institute, and the College of the Holy Cross among them), the hip factor is fairly low. I am famous - surely fortune will follow! It is nice to be acknowledged and wonderful to get free publicity. I've been announcing at Brockton Symphony Orchestra concerts for six years, and asked if I might be listed in the program book. How sweet to see that my informal title has been formalized and preserved for posterity. 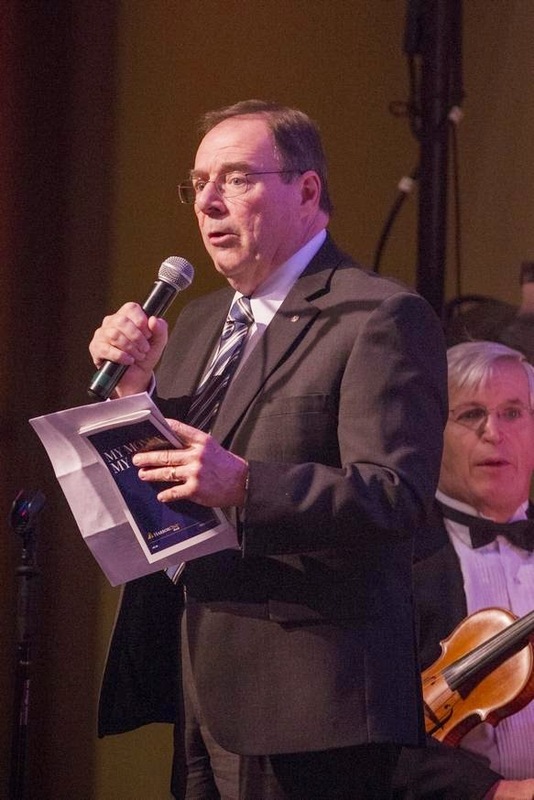 "The voice..."
It is also nice to see an entire gallery of photos from yesterday's magnificent concert, including one of yours truly at the microphone, in the Brockton Enterprise. The Brockton Symphony Orchestra performed on stage during a concert at Oliver Ames High School in Easton on Sunday, Nov. 2, 2014. As soon as I saw the photos I posted a link to the article on Facebook, noting a couple of possible errors, I immediately wrote, "One caption referred to the violas as violins, another called the bass a cello, but they got the French Horn right and didn't call it a tuba..."
Shortly after posting that I started to feel guilty and mean-spirited, so I added a comment saying, "Perhaps I'm being hasty. The caption said 'violinists...perform' while showing viola players - are they violinists rather than viola-ists? I don't know for sure. [I think the proper term is violist, but my research has proved inconclusive.] Same for the bass. Caption says'"cellist plays' not 'plays the cello in this picture.' How do I know the fellow playing the bass in the picture is not also a cellist? Pardon my rush to judgement and play for cheap laughs." If you click on the link you can see all 17 photos by Scott Eisen/The Enterprise. Thank you Brockton Enterprise for sharing this positive news about our "Greater Brockton Treasure" The Brockton Symphony Orchestra! Welcome! If this is your first concert, prepare to be dazzled by our wonderful orchestra and our incredible soloist, Davin Shin. Regular listeners know I’m not exaggerating. Welcome to our guests from Orchard Cove. My name is Harry Williams. I am a member of the Symphony Board and like so many, I am a volunteer. 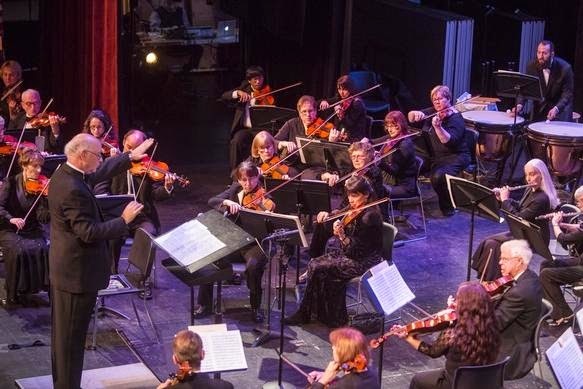 The Brockton Symphony has no paid administrative staff – we depend on the Board, orchestra members, and volunteers from the greater Brockton community to enable us to keep putting on our concerts. Your generosity is not diverted into administrative costs, your donations support concerts, community outreach and scholarships. You can be like our principle sponsor, Harbor One Bank, and advertise in our program book. You can join our dedicated volunteers. Most important is what you are doing today - attending our concert. No audience – no Symphony! The donations jar in the lobby is for the Brockton Public Schools Music Scholarship Fund to fund music lessons for elementary & middle school students. Today’s concert is dedicated to two cherished friends of the Symphony, each of whom gave generously of their love and energy to the Brockton Symphony Orchestra: Carol Elledge and Bill Northrup. Maestro Orent will share memories of each during the concert. Be sure to sign up for our electronic newsletter, the Fanfare, in the lobby, and save the date for our Holiday Pops concert on December 7th. Please turn off your cell phones. After the concert join us in the Dining Hall for refreshments and to meet members of the orchestra, Maestro Orent, and our Classical Staff volunteers. Concertmistress Irina Fainkichen will tune the orchestra, then you can join me in welcoming Maestro James M. Orent.